AT&T is gearing up for the launch MMS that is scheduled to happen in three days (September 25th). They have started sending a text message (screenshot below) to customers that informs them of the date in which MMS will be available and that while they prepare for the launch, they will be turning off the “view my message” experience. Let us know in the comments if you have received your text from AT&T yet… I haven’t! 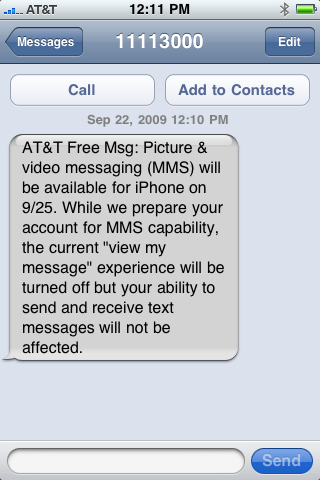 The “view my message” experience is the current method used by AT&T that allows iPhone users to view MMS messages by providing them with a temporary username and password which must be signed into using a computer and the MMS is then displayed in flash. AT&T Free Msg: Picture & video messaging (MMS) will be available for iPhone on 9/25. While we prepare your account for MMS capability, the current “view my message” experience will be turned off but your ability to send and receive text messages will not be affected. Hey you can update your carrier file already and recieve MMS. There is a tutorial around here somewhere. Posted about two weeks ago. Got mine working on my jailbroken iPhone 3G 3.0.1. Works beautifully. Don’t have to be jailbroken either. Nothing here in Utah yet. Haven’t received anything either. On another note, I did that “early” update that this site had previously released. I did it on 4 different phones, 2 immediately were able to send and receive mms, but not the other 2. Very strange how it works for some and not the others. Thanks for all the updates though! Still waiting for the ATT message, but MMS does work on my 3Gs 3.0.1. Also works on the 3G 3.1, but neither my son nor I have received the message. Note: MMS works currently due to us updated our messaging config file. I’ve never ever received a text from AT&T about anything upcoming on my phone. not yet but i’m always like a few days late on getting texts from AT&T. I can now send in Phoenix and my wife can receive but what is weird is that her sends FAIL. How can that be? No text message here in north Texas. But I will say getting MMS will be the most underwhelming feature for the iPhone. I still don’t understand how getting an MMS (that deducts from my text data plan) is better than getting an email with a attached photo (which is unlimited). why is there an itunes update 9.0.1?? has this have anything to do with the AT&T ipcc file? Turning off the (“view my message” experience) does that mean that the origional iPhone users will have MMS? On a family plan, the mrs and I have MMS and tethering using the hack! Since last week! I too have had MMS since the carrier hack came out. I believe Alan is right because I am on a family/business plan and mine works. Same with my brothers work iPhone 3G, but my gfs (on a single user account) doesn’t work. i will wait until this friday that att get’s mms now . oh wait 3 yrs late!!! Me too. I will be dumping my whole camera role on numbers not even in my contacts and then some. I’m still on 3.0 and jailbroken ( have a 3GS ) and used the hack in this site a few days ago to enable MMS – and MMS started working today. Okay my MMS experience i have sent so many in the alst few hours and received alot. ok the weird part is some people 4warded me those sms video avator with songs included sometimes funny or retarded (no offense) okay they show up as 2 separate messages 1 with the video no sound and the other a quicktime sound file okay now how to put them together??? hmm also if ai get animated msgs n save them they show only as pics in the photo library. is this got anything to do with lack of flash support?? I live in South central IL, near springfield..
Will apple send out a update my 3g 3.1 iPhone does not have the mms option ? Yes, one should be released tomorrow. A carrier update. I haven’t received one and I’m not holding my breath on this launch date.AT&T has lied on SO many issues with me personally and in so called public ” statements” I hate them!! So if we already have the 5.1 ipcc do we need to roll back to 5.0 in order to get the official?